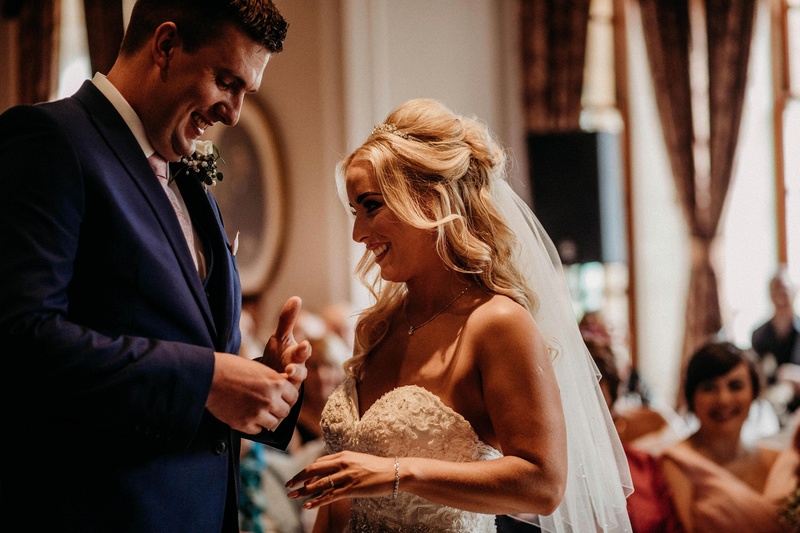 Searching for a venue with exclusivity, that would become a home from home for the bride and groom for their day and nighttime celebrations – Rebecca and Martin loved everything about Crathorne Hall in Yarm. And we can see why. The venue boasts a classic interior and the most amazing grounds, perfect for those precious wedding day photographs. Keeping the theme simple – “modern and girly” as Rebecca describes it, the styling is understated and chic, with a light pink colour palette and lots (and lots) of fabulous flowers! With images by Nikki Paxton. Rebecca says: We got engaged on 9th June 2017 while in the Lake District, five days before my birthday. We had already stayed at the same log cabin previously, so Martin had got in touch with the owners to help him with the proposal. We arrived at the cabin on the 9th June and went straight to the local pub for dinner. As we headed back to the log cabin there was a photo of us on the front door with ‘PTO’ written on it. By this point I kind of guessed what was going on. I followed the instructions on the photo and went inside the log cabin which was covered in a trail of rose petals with photos of us. When I got to the double doors at the back of the cabin, Martin was down on one knee with a huge ‘Will you marry me’ sign lit up, which he had made himself. More importantly he had a two-liter bottle of Moet waiting for me. Of course, I said yes. 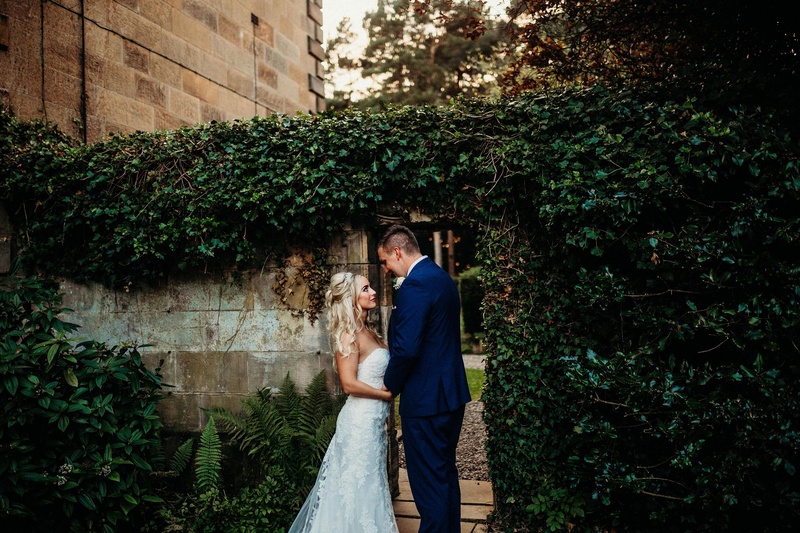 We got married on 22nd September 2018. I liked the idea of getting married after the summer and it was also Martin’s birthday, so he has no excuse to forget our anniversary now! 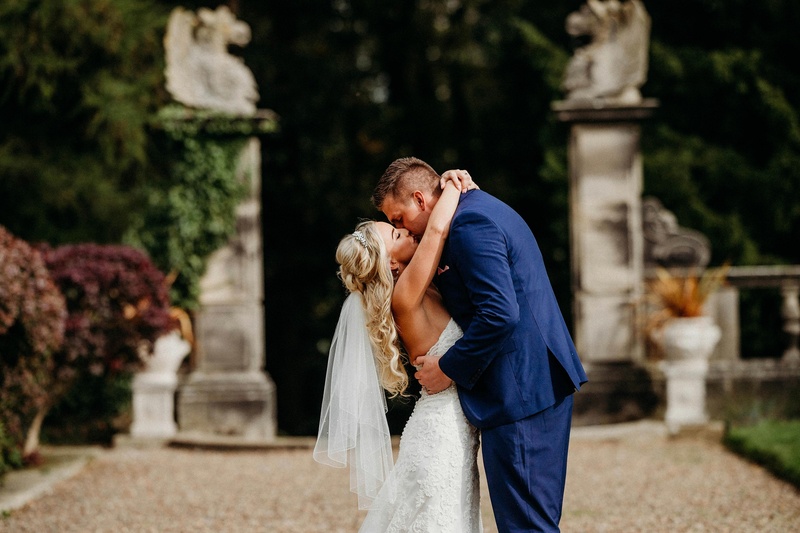 We had our ceremony and wedding reception at Crathorne Hall in Yarm and it was the most beautiful and perfect day. I live near Yarm and I have always loved the venue. I also love the fact you can have an exclusive wedding there, which is what we did. It felt like it was our home for the day and night. I wanted to stay in one place all day too, as I thought it would be more relaxing not having to travel anywhere else. The grounds and views at Crathorne are breathtaking and both families thought it was beautiful. I didn’t have a particular theme as such. I wanted quite a modern and girly look, with lots of flowers!! We went for a light pink colour scheme. Although I am in the military, I am such a girly girl and I have always loved pink. Luckily my husband is so chilled, and he just let me have what I wanted! My dress was from The Bridal Lounge in Northallerton. It was an Ella Rosa design. It was the first dress I tried on in the first shop – Charlotte actually had it waiting for me because I had told her I liked it before I got there. I just knew it was the one. I wanted to go for a fitted and strapless dress, as I thought that would best suit my shape. I also love the lace on the dress and the belt, which was already fitted to the dress. I had other bookings in other bridal stores, which I cancelled straight away. When I have my mind set on something then there is no going back! 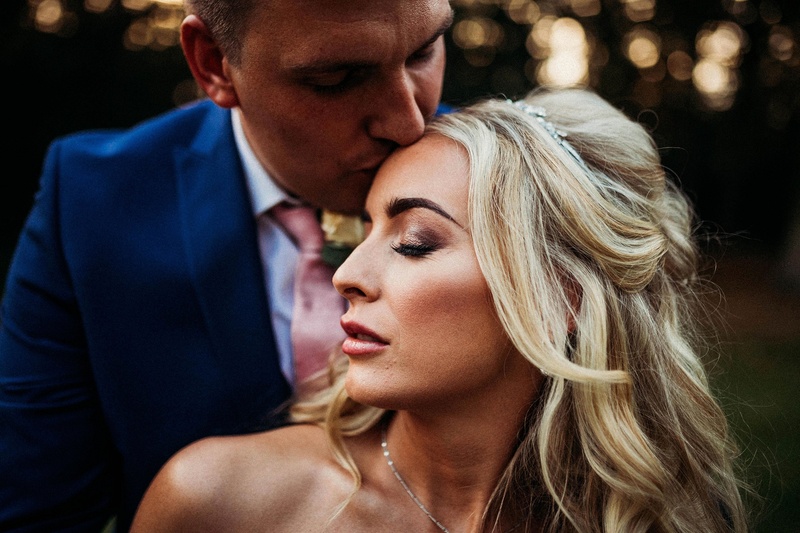 Charlotte at The Bridal Lounge was such an amazing help too – I couldn’t have done it without her. She also helped me pick the perfect veil and tiara to go with my beautiful dress. Martin wore a navy blue suit with a waistcoat, and a pink tie and brown shoes – all from Next. The groomsmen all wore navy blue suits and pink ties from Next. My bridesmaids had beautiful pink dresses which were from Posh Frocks in Billingham. My makeup artist was Kim Blair from Ingleby Barwick, and stylist, Lisa Cameron from Newcastle did my hair. They were both fabulous and we all had such a laugh getting ready together. I stayed at Crathorne Hall the night before the wedding, which I loved. My mum, bridesmaids, my auntie and I all get ready in this huge room, with the hair stylist and makeup artist which was amazing. We had our breakfast brought up to us and we had lots of prosecco and music to keep us going, it was so fun. My photographer was Nikki Paxton. Luckily, I knew Nikki already so I knew how amazing her work is – literally amazing! She is so easy to be around and you kind of forget she’s your photographer, and you end up seeing her as part of the wedding party which made the photos even more natural and easy to take. We didn’t have to pose or even think about it, she just does what she needs to do, and the pictures were absolutely amazing – I am so happy with them. Birds and Beards captured our day on film – Nikki Paxton again accompanied by Ross Wilson. After seeing other videos of previous weddings, I wouldn’t have anyone else has a photographer or videographer. I had a really large spray of flowers including white and peach lisianthus, peach avalanche roses, pink hypericum berries, white Bouvardia and peach carnations, plus gypsophila and foliage. 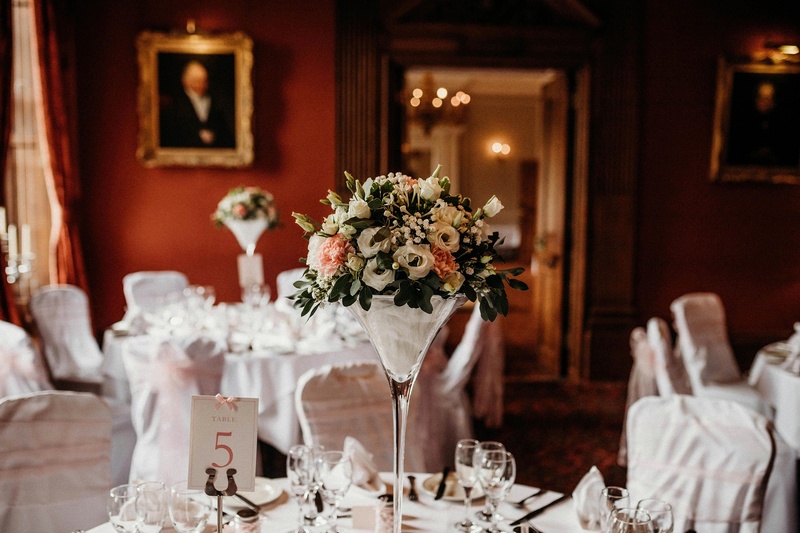 The flowers – provided by Flowers by Michaela (Michaela-Jo Hutchinson) – were all pink and neutral colours to go with the wedding theme. My bridesmaids also had a small bouquet each. I had a beautiful spray of flowers spread on the table for the ceremony, which was later moved to the top table. I also had Martini glasses on all of the guest tables, which were filled with flowers. As favours, I ordered small glass Mason jars that I filled with small white and pink marshmallows. I tied the tops of the jars with lovely pink ribbon and a nice ‘Mr & Mrs’ tag. I had a gorgeous three-tier cake consisting of lemon, vanilla and almond flavours. The roses added to the cake were all handmade beautifully by Jen from Jen’s House of Cakes in Ingleby Barwick. As we booked the wedding as ‘exclusive’ we had a taster night as part of the package to decide on the meal served. For starter, we had tomato soup, followed by beef and Yorkshire pudding. To finish, we had sticky toffee pudding and ice cream. We just went with our favourite dishes and the favourites from the taster. We also thought everyone else would love it too. With us both being northern there was no way I wasn’t, not going to have Yorkshire puddings. Our entertainment was Aaron Bayley band. We booked Aaron and one singer to sing at the ceremony and the reception. Everyone kept commenting on how amazing his voice was. He was on Pop Idol after all! On the evening the rest of his band arrived and all of our guests couldn’t stop dancing all night, everyone loved it. We had seen him previously in Newcastle and they were such a down to earth band and absolutely beautiful singers and brilliant musicians. We booked a photobooth as part of Aaron Bayley Band and it made such a difference. The photobooth was never empty. It was such a lovely thought because they gave us a guestbook so our guests would put their picture in afterwards and leave us a nice comment. Normally people dread the speeches as they can be long and boring, but with our wedding we actually had quite a lot of speeches and it added so much humour to the day. My mum and I made speeches as well as the groom and best man. I have never seen so much laughter from speeches at a wedding before. My grandma who is 92 has always been very close to me and she really helped us with the wedding. 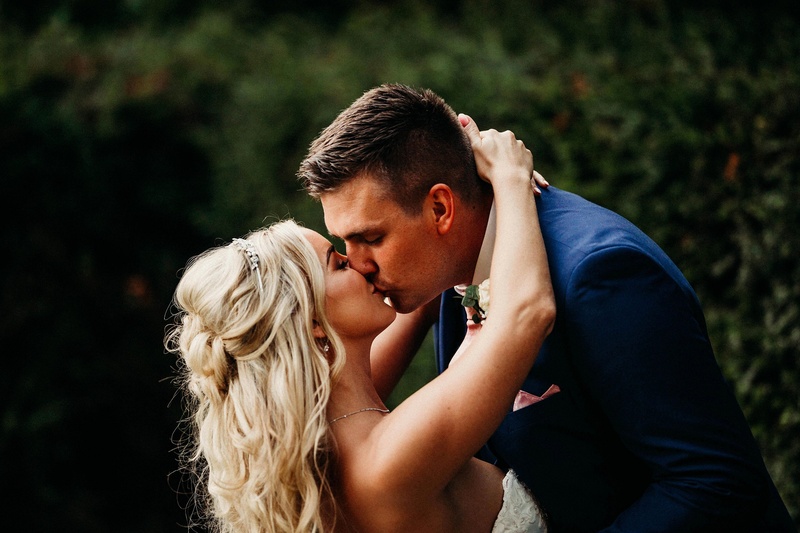 During my wedding speech my husband gave her a gorgeous bouquet of flowers and we also gave her a bottle of her favourite perfume, Chanel No.5. I just wanted her to feel special, and she loved it. Krista my coordinator and the team on the day just made the day perfect for us. It was because of them it all went so smoothly. They were such a lovely team and so friendly and down to earth. I spent three nights there over my wedding, it felt like my second home. They set up all the tables for us and they just had their own special little touches. I never thought I would be so stress-free. With me being in the military, it was difficult at times with me living away, but they always did what they could to accommodate us. My husband said his favourite part was seeing me walk down the aisle. I think this was because I was 30 minutes late, and he told everyone I wouldn’t be late (I’m so strict with timings normally). It’s really hard to try and pick a favourite part of the day because I loved every single minute. I loved it after the first dance because that’s when everyone really came together and danced all night long, as well as using the photobooth all night! We went to the Maldives and stayed on a water villa which was absolutely breathtaking. This was booked by Lorraine Rennison who works for Travel Counsellor, which is a private travel agent. I have never seen such an amazing place, the seas were crystal clear and the sands were so soft. The staff were so friendly which made the honeymoon even better. We snorkeled straight from our room most mornings and swam with small sharks. Some days we would just sit in our jacuzzi taking in the view having a glass of wine. The concierge soon realised I loved rosé, so he made sure I had extra bottles. We also spent a lovely evening having a candlelit dinner on the beach on our own. I cannot recommend it enough, it was a holiday of a lifetime. My top tip for other Brides Up North would be: organise everything straight away like I did and then there is nothing to be stressed about. Don’t leave anything to the last minute. I also made sure I did my homework with all my suppliers, which also helped my day to be perfect. No one could believe how calm I was. I didn’t really get stressed at all. I’ve been in the Army/Royal Air Force for ten years now, so I think that’s helped me to be super organised, so that definitely helped! 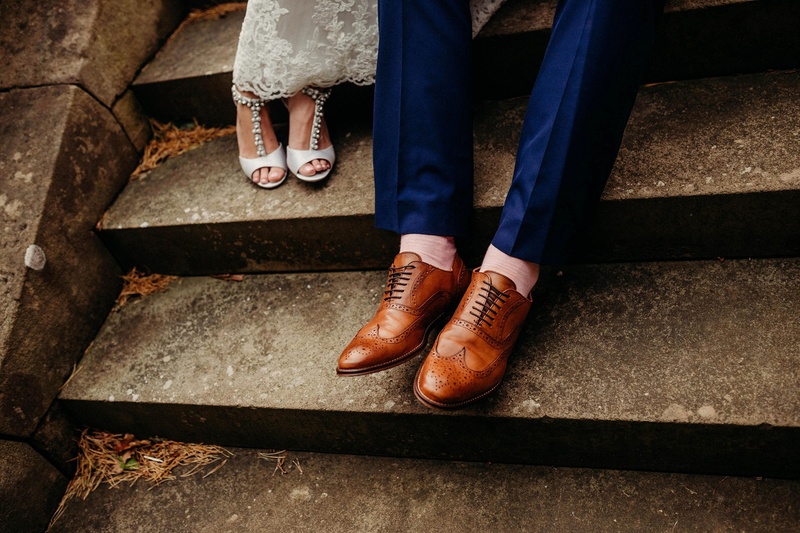 During the planning, I loved looking at the real weddings on Brides Up North as it was so lovely to read other people’s stories and to also get inspiration. There are some beautiful features and photographs on there. We are now expecting our first baby, as well as recently getting our first pup – a German Shepherd puppy!